Ted Goins and family, including his wife, Cheryl, and his parents, Mr. and Mrs. Ted Goins, Sr., after receiving his honorary doctorate degree from Lenoir-Rhyne University on Dec. 13, 2018. 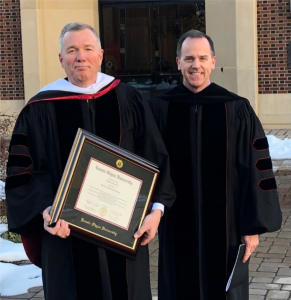 On Dec. 13, 2018, Ted Goins received an honorary doctorate degree from Lenoir-Rhyne University. Ted Goins is one of those people who seems to be everywhere — whether it’s at the Men’s Bible Study on Thursday morning at Trinity Oaks, at a Chamber of Commerce breakfast at the same location on the same morning , visiting one of Trinity Oaks’ sister locations, or driving to Raleigh to advocate for immigrants and refugees. There’s a good reason for all of this. For the past 18 years, Goins has been executive director of Lutheran Services Carolinas, an agency that represents the 2011 merger of Lutheran Services Carolinas and Lutheran Family Services in the Carolinas. Goins likes to say this agency cares for people from cradle to grave — providing services related to adoptions, foster care, developmental disabilities, mental health, refugees and immigration. Local folks might see him frequently at Trinity Oaks Retirement Community. In addition to overseeing this facility, Goins’ parents, Ted Sr. and Frances, have been residents there for the past 3½ years. The two just celebrated their 66th anniversary, although Frances recently moved to the Virginia Casey Center as her dementia continues to progress. Goins says it is a blessing that he lives so close to his parents now — as close as he’s ever lived as an adult. If he’s in town, he pops in to visit. Goins’ association with LSC, as a CAN, began in 1981, when he took his training under Isaac Kuhn, whom he calls “Mr. Lutheran Home.” Goins still keeps his certified nursing assistance license current, he says, “because I don’t want to lose touch.” He works an eight-hour shift once a year at one of the LSC facilities. The person who probably knows him best professionally is his executive assistant, Karen Maddry. The two have worked together on and off for 35 years, she says, and he became her boss in 2000. At this very moment, he and Cheryl, his wife of 28 years, are in San Antonio, Texas, visiting their grandchildren, Addie and Landon Troup, the children of daughter Sara Rowe Troup and her husband, Devin. The couple’s other daughter, Meggie Rowe Lail, married her husband, Jimmy, in May 2018. 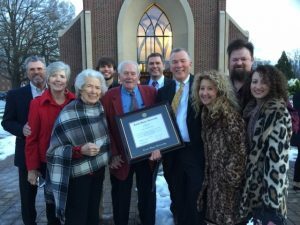 The month before, Dr. Fred Whitt, the president of Lenoir-Rhyne University — the alma mater of Ted and most of his family — had called to tell him that the university’s board of directors had voted to confer an honorary degree for Goins at the May graduation. Which was nice, although Goins had to keep that information to himself for the rest of the year. And his mother was the homecoming queen during her tenure there. “We were determined to have her there whether she knew it or not,” Goins says. And she was, along with a number of other close family members, including his dad, his brother, John Goins of Hendersonville, and his sister, Mary Goins Clemmer of Cherryville. Goins says he at first thought the president’s call was for his dad. With a $143 million annual budget, LSC includes 2,200 employees, 10 senior services operations, and three main child and family services offices, which include immigration and refugee services. The vast majority of these are direct care workers, many of whom are themselves immigrants — which is why Goins finds himself in Raleigh so often these days. Goins has had his share of hate mail — and was even the target of a leaflet campaign by the Ku Klux Klan.